Published in 2002 by Penguin Books. Shortlisted for the Man Booker Prize in 2002. Captain Everard Gault wounded the boy in the right shoulder on the night of June the twenty-first, nineteen twenty-one. Aiming above the trespassers' head in the darkness, he fired the single shot from an upstairs window and then watched the three figures scuttliIng off, the wounded one assisted by his companions. I feel really bad about this book. I picked it purely as it ticked all the right boxes for my challenges, I had never heard of it before and thought the title a little boring. For that reason only, I read this book and I now realise it was worth more than a mere box ticking process. This rather thin book, with its understated cover and very plain title is a really beautiful, poignant book waiting to be discovered. It is a quiet, unobtrusive book that cuts you open wide and plays on your emotions. It is one of the those books that will make you think about your future, leave you wondering who will be there to look after you when your loved ones have passed on or moved on. This book shows how one simple action can change the lives of so many people, causing irreversible disaster to all that it affected. Lucy's childhood is idyllic. Lucy lives with her wonderful parents, who dote on their only child. She lives by the sea in Lahardane, in Lahardane, Ireland, surrounded by the woods and the glens. When Lucy reaches eight, her world becomes dangerous, after her father ( a Protestant ) shot and wounded a Catholic boy who was preparing to burn his house down. No longer feeling safe in the family home, Lucy's father prepares to take his family overseas until the present dangers pass. Lucy is angry about having to leave her home and determined to stop her parents leaving, so she disappears, leaving her parents to believe that she has drowned. The story then moves onto to show how Lucy's ill fated decision affects all the people she loves and changes the course of her own destiny. Within this book, there are lots of events that don't happen. These events come very close to becoming reality and then by chance they end up not happening, leaving you with a curiosity as to how the story would have occurred if they had happened. If the Catholic lad had been successful in burning down the Gaults house, the story would have obviously had a very quick ending, but you would have looked at how the effects on the Catholic boy may have given him a different perspective on his life. Throughout the book, he reappears and lives with nightmares of what could have happened. He can not sleep without seeing Lucy die as a child, which leads to his eventual madness. I found Lucy's disappearance a little difficult to believe. I know if it was a child of mine, I would never give up the search, where as Lucy's parents presumed her dead, after finding her vest. A thorough search of the surrounding areas never occurred, if it had, the circumstances would have been different. So I found that part rather unrealistic. After finishing this book, I could not help but contemplate my own future. I have always felt blessed to be surrounded by my family, however I very aware that one day that could change. I look at my own parents who until recent years were surrounded by family. Both of their children moved away and their siblings passed on, followed by dear friends. As much as I include my parents in my life, they still live two hours away from me, with little chance of them ever living closer. I know that as time passes, being alone at some point in life, is almost a rite of passage, but it is a scary thought. You cannot depend on people being there for you all your life. Within the book, Lucy copes well with the loneliness, as she has grown up with the feeling of abandonment. In fact, I would almost say she is content to be alone in old age and living with her past constantly surrounding her in a house that has not altered since she was a child. I am not sure I would cope as well as she did with such loneliness and I love my own company. When I think of Lucy, I think of The Beatles song Enola Gay. The characters are well written. You cannot help but feel sorry for Lucy. She spends most of her life, regretting a decision she made at the age of eight. She hates herself for the pain she puts her parents through and never really forgives herself for her actions. Imagine living with the same guilt all your life. I would definitely recommend this book. I enjoyed this book a lot more than I ever thought I would. 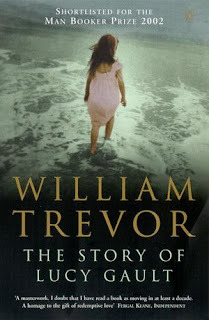 William Trevor appears to be an understated writer and this book is a beautiful example of his work to read. You're right. The title alone wouldn't make me pick up this book, but your review does! Great review, Vivienne. The message of the book sounds wonderful and I think I would like it! Beautiful review Vivienne. I don't think I would have been tempted to pick up that book either. It certainly sounds provocative but I think Lucy's parents would aggravate me no end. The conflict between protestants and catholics is so weird to me. How much is that explored in here, or was it only skated over as a plot point? While this book definitely intrigues me in many ways, I'm not sure I could get past that bit you found unrealistic. Because I can tell you right now that I would find it maddeningly unrealistic, too...and I'm afraid it would color the rest of my reading experience. I honestly can't imagine my 8-year-old being able to pull off his disappearance so well that I would just stop looking. I don't think many parents would EVER stop looking without a body. What a touching review. It really made me think about a topic I sometimes try to avoid. I own this book but it has sat on my shelf (your cover is prettier than mone). Now I know I have to read this book Viv. Thanks so so much for reviewing it! Fantastic! Hi Viviene! I have yet to read a novel by William Trevor. Thanks for the review! He's another author that I have to check out soon! I had some of the same thoughts when I read this book a couple of years ago. I found it to be haunting, yet beautifully written. It was my first Trevor novel, but I know I have a couple of others in this house! Oops sorry Viv, that's me trying to multi-task and have more than 2 screens open at once. Doh! I actually really love the sound of this book. I think the bit you mentioned would niggle me too but the rest of it just sounds so fascinating. I love the imagery you've conjured up with this review - can't wait for your own book! I think our reading styles may be a lot alike from what I have seen so far. Going to need to add you to my reader. Great reviews and this book looks wonderful! What a wonderful review...I wish I could put into words how I feel about a book so honestly...and include personal thoughts as well. I might give this book a try based on your review. You write beautifully! This is one that I wouldn't have picked up at all without your recommendation. I'll have to keep it in mind. I'm like you - I don't think I'd ever give up looking for someone I love if they were missing. The book does sound good, though and I love the cover - the body's not cropped. Passionatebooklover and Kaye - isn't amazing how covers affect the books we buy. Blodeuedd - I don't think this book is for everyone. It really is a quiet book. Amanda - the conflict between the Catholics and the Protestants only plays a minor role in the book. It appears to underline the whole story. Debi - you are completely right. I really did find that part hard to get my head around. I actually ended up hating her parents because of their own stupidity. Lucy actually does hide her disappearance well. However, she actually thought she would be found and her parents would just decide not to go. The whole thing backfires on her. Teddyree - I like to look at books from a personal view. I find it interesting to relate them to my own life. Diane - I think this is a topic we all tend to avoid ever really contemplating. Peter S. I would definitely recommend reading it. Kim - I am pleased to hear you had similar thoughts about the book. Carmen - if I ever get it written, you can have first signed copy. It was a beautiful book. Bookjourney - welcome to my blog. I shall come and visit your site too. Love to meet new people. Missy - thank you for your lovely words. I try to write from the heart and put what I feel into words. Alyce - I hope you enjoy reading it. I always see you as an expert book reviewer, so I hope I can live up to your excellent standards. Bermudaonion - it is so true. I imagine most of the population would struggle to give up looking for the one they have lost. Sounds like a great book! I'll have to check into it. I have tagged you for a meme. If you want to take a look hop over to my place, Just Books. Have a great evening. I am definitely getting this one for my shelves, Viv. "This book shows how one simple action can change the lives of so many people, causing irreversible disaster to all that it affected." Sounds intriguing, like a must-read. I've not read anything by this author but I would've picked it up just by looking at the cover. It's beautiful. Your review is wonderful too, Viv. I read one of Trevor's short story collections a few years ago, and I have to confess it didn't make much of an impression on me. This novel sounds much more to my liking, though, so I think I'll give him a second chance! I love when a book surprises me. You know, I read this awhile back and found it to really drag in places. I almost didn't want to finish it and then forced myself. I didn't much enjoy the experience, but I'm glad you did.